WOOOOOOO!!!! | The Vermont Political Observer. For the first time, America has elected a member of the WWE Hall of Fame to the presidency. Yes, Donald Trump is enshrined in that (so far) imaginary Valhalla of pro wrestling legends due to his starring role in WrestleMania XXIII (which, fittingly, involved hair). It all fits together, in fact; about the only way I can frame Trump’s victory is in pro wrestling terms. But he’s not Vince McMahon or Stone Cold Steve Austin; he’s this guy. 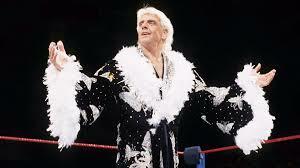 For those unfamiliar, that’s Ric Flair, legendary grappler who proudly calls himself The Dirtiest Player In The Game. That stylin’, profilin’, eye-gougin’, low-blowin’, referee-distractin’, 16-time World Champion, the lifelong bad guy who nonetheless captured the hearts of wrestling fans. And then there’s the womanizing, the preposterous hair, the impenetrable shell of narcissism resistant to any personal, legal, or financial problems. Donald Trump is Ric Flair. Trump heeled it up, and the crowd cheered. And just like a heel champion, his favorite thing in the entire world is to shove his title belt into the face of anyone who hates him or doubts him. In truth, I have no idea what Donald Trump will do with the presidency. He doesn’t really give a damn about policy. All he wanted was the title belt, and now he has it. He may be perfectly happy to spend the next four years shoving that belt in our faces, and letting Newt Gingrich and Rudy Giuliani and Sheldon Adelson and the Koch brothers run the country. The winnah….. and NEEEEEW World Heavyweight Champion…. 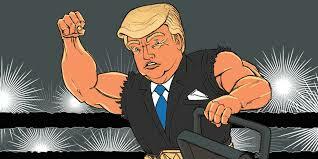 This entry was posted in 2016 election and tagged Donald Trump, heel tactics, preposterous hair, pro wrestling, Ric Flair, WrestleMania on November 9, 2016 by John S. Walters. For crying out loud, the ONLY ones to blame for the Trump “victory” is the Democrats who didn’t bother to vote ! Trump received fewer votes than either McCain or Romney ! Hillary Clinton was a terrible candidate swaddled in the stench of the prior Clinton Administration, the Clinton Initiative and her own hapless service as Secretary of State. “What difference does it make ?” EXACTLY ! Check out the PBS Newshour yesterday for a detailed piece on the state of election hacking in 2016 (“Here’s How Hackers Might Mess With Electronic Voting on Election Day”) as well as this from the NYT 4 days ago (“A Muted Alarm Bell Over Russian Election Hacking”) . 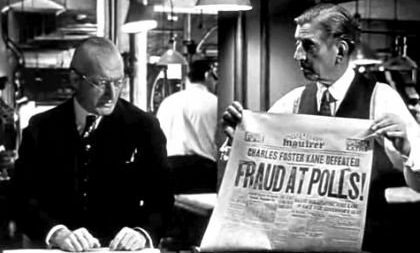 Add to the mix the startling/freakish turn of events last evening – when predictions reversed within 30-45 min – and, again, the Times today, about how the media, the polls, the paid predictors failed (“A Dewey Defeats Truman Lesson for the Digital Age”). Were they really that wrong? If so, how and why were they so off base?